My apologies for being a full week late with posting the Picture of the Week 35. To make up for it, you’ll be treated to two weekly editions today, this one now, and the next one tonight. Take a look at this photograph and see if you can figure out what’s going on. Before I explain it, let me explain how I literally went about taking pictures. My wife and I spent the better part of last Sunday at the Getty museum, our favorite museum in Southern California. After a couple of hours of seeing an exhibit of Klimt drawings, Michele wanted to see another exhibit, but I decided to take some photos instead. We agreed on meeting again 45 minutes later. How to make the best use of that time? I started by walking around slowly, looking in different directions, and trying to get inspired by a possible composition. I did this without thinking too much, I wanted something to visually grab my attention. 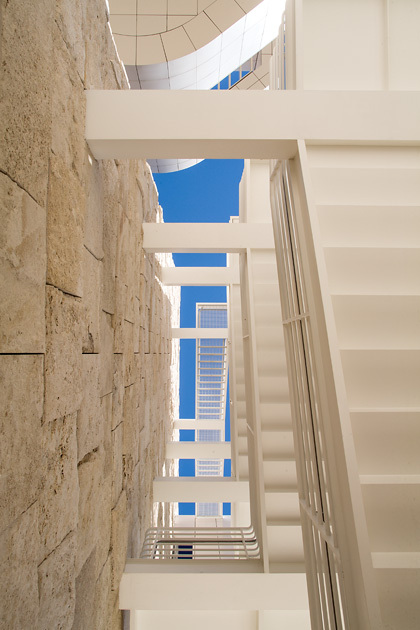 Doing it slowly was important since small changes in position or viewing angle can make a big difference in composition, especially at the Getty. Once something caught my eye, I stopped, and then tried to figure out why I was attracted to it. Was something framed in a interesting way? Was there a contrast of shapes, colors, materials, etc.? The next step was trying to frame the photo such that the resulting image would maximize the effect that had made me stop in the first place. Finally, it was sometimes a matter of waiting a few minutes until there were people in the right places to complement the composition. Ok, back to the picture of the week. I first noticed the stairs from a distance, and wondered how I might arrange the multiple flights of stairs in a composition. As I walked over, I also noticed the contrast of materials, the marble on the left, and the painted metal of the stairs on the right. Finally, while playing with compositions, I thought: “What if I take a picture looking straight up?” I liked the possibilities I saw through the viewfinder, but realized that I need to compose very carefully. So, to steady myself, I lay down straight on my back. Incidentally, when I was done taking the picture, and started to get up, a guard was standing right next to me, almost hovering over me. I apologized if I had been in the way of anyone, but it turns out he was worried that I had slipped and hit my head. I quickly assured him that all was well.